Act #67: Own your privileged status. Last week my son came home with a slip of paper, proudly declaring that he needed $5 and our permission for something. We soon discovered that his kindergarten class was planning a little field trip next month - to a Disney performance called Dare to Dream, a three special fairytale mix of Cinderella, The Princess and the Frog, and Rapunzel. Well, you probably aren't surprised that I did what every average feminist mom would do: 1.) I sat my son down and asked him if he really wanted to attend this event or if he felt like he had to go because his class was going (He wasn't really pumped about the show but being the rule-follower that he was, he didn't want to let his teacher down); 2.) I caught his teacher one morning to thank her for organizing the trip and pushed a little about the choice of location (Turns out, they had tried the zoo and aquarium in the past, but because we live so far away from civilization, travel time to and from those sites took up the majority of the day, leaving the kids little time for experiencing the sites themselves. Additionally, the school was able to get a substantial discount allowing for underprivileged students the chance to attend something they may not have had the chance to attend otherwise); 3.) I offered my son an alternative to the Disney field trip - a day trip to the aquarium with his parents (He did not hesitate to accept); and finally 4.) I began preliminarily planning a list of future educational day-trip ideas for his first-grade teacher - like the children's theater, a local historical home called the Henry Clay Estate, the Toyota plant (you'd be surprise at just how cool the robotics and behind-the-scenes tour is) or nearby Shaker Village. I love my son's school and know just how committed they are to the children and how open they would be to thinking a bit more critically about experiential education. So I tore up the permission slip, giving myself a high-five for not conforming to the systemic perpetuation of female stereotypes. 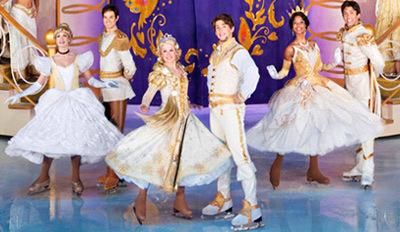 With all the effort I've been making to shift my son's thinking away from the notion that all girls are princesses, and all princesses need to be rescued, the last thing I need is for him to attend a princess performance on ice. And then it occurred to me just how privileged I was to be able to make this decision with and for my son. I doubt any single, working mom could arbitrarily tell her minimum wage employer that she was taking off work so she could pull her kid out of school for an "alternative" field trip. I doubt she could whip up aquarium admission tickets for 3, lunch, breakfast, and gas money to pull off such a trip. And what about all those kids whose parents can't afford full-price Disney on Ice tickets, or have the time and resources to make the trip to the next big city for a performance? What if some of these kids didn't even have the type of parents who cared about exposing them to any experiences outside the home? And just like that, it hit me, that sometimes the opportunity to practice feminism and activism comes a heck of a lot easier if you come from a place of privilege. I'm still grateful that my son didn't want to attend the princess on ice show, and that we now have an awesome family fun day planned! But I'm also now more painfully aware that inequities exist in every fiber of our communities - even in one's capacity to stand up for something they believe in.